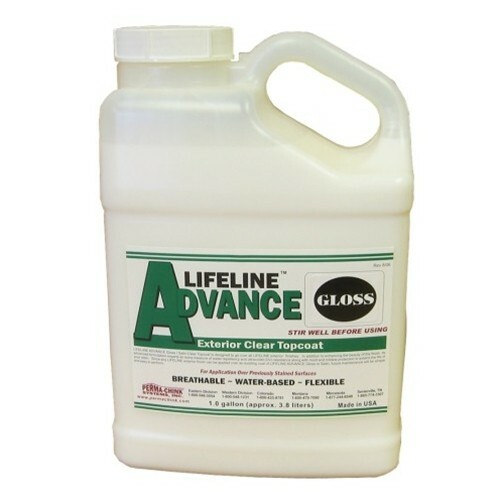 Lifeline Advance works just like the clear-coat on your car to protect the color coat underneath. It extends the life of the finish while adding depth and highlights to the appearance. It makes your exterior walls easier to keep clean. SKU: LL-ADV-TC. Categories: Exterior Finishes, Perma-Chink. Tags: advance, advanced, exterior, life line, Lifeline, lifeline advace, Lifeline Advance Gloss & Satin. Lifeline Advance Clear Exterior Top Coat works just like the clear coat on your car to protect the color coat underneath. It extends the life of the finish while adding depth and highlights to the appearance. It makes your exterior walls easier to keep clean. Lifeline Advance has the right permeability to keep the film breathable while repelling water. 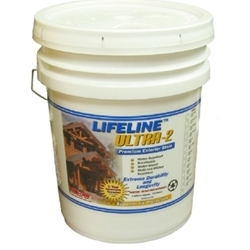 Lifeline Advance is the second component in Perma-Chink System’s exterior wall finish system that includes a limited warranty when used with Ultra-2 and Ultra 7. Please Note: Lifeline Advance Clear Exterior Top Coat is formulated only for use as a top coat for Lifeline Exterior, Ultra 2 and Ultra 7. Lifeline Advance should not be used on its own or over other stains or finishes not formulated for use specifically with Lifeline Advance. For more information on finishes compatible with Lifeline Advance, please visit the Lifeline Ultra 2 and Lifeline Ultra 7 product pages. Which Works Better? Satin or Gloss? When it comes to performance and longevity a gloss topcoat will outperform a satin topcoat due to reflectivity. A smooth glossy surface reflects more UV light. The next factor is cleanliness. The smooth, slick surface of Advance Gloss sheds dirt easier than the Advance Satin. That’s because the flatting agent used in the Satin results in microscopic imperfections in the surface of the finish where airborne dust, pollen and pollutants can lodge. Although they can be removed with a good washing, it takes a bit more effort than removing dirt from a glossy surface. The last factor, at least in the Southeast, relates to how Advance Gloss reduces carpenter bee damage. Perma-Chink Systems did a survey of customers who used either Advance Satin or Gloss topcoats and the results clearly revealed the Gloss topcoat substantially reduced the number of carpenter bee holes. Although there was some reduction in carpenter bee activity using Advance Satin it was not nearly as significant as the Advance Gloss. Whenever requesting exterior finish samples, include a sample of Advance Gloss even if you are only interested in Advance Satin. You may end up choosing the Gloss because of the way it looks and how it highlights the color of the Ultra 2 or Ultra 7.
future maintenance will be simple and easy to perform. Lifeline Advance is available for shipment all over the continental United States via FedEx. 99% of all orders ship within 24 hours of receipt from our warehouse in Western NC. Be the first to review “Lifeline Advance Clear Exterior Top Coat” Click here to cancel reply. 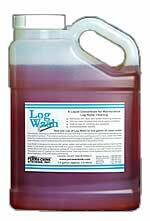 Log Wash™ is a pH balanced, liquid concentrate for cleaning both exterior and interior log and wood surfaces. It can be used as a maintenance cleaner and/ or to prepare the surface of wood for a maintenance coat of stain or topcoat, especially wood on which Perma-Chink Systems products have been applied. The Wooster Professional Stain Brush is a professional bristle/poly blend stain brush for use with all stains, sealers and wood toners whether water-based or oil-based. The two coat application of Lifeline Ultra-2 color helps to ensure consistent color development on your walls. From the day that you apply it to the many years of durability that you get from it, this wood stain will distinguish your home.